WooCommerce plugin is required to monetize website. 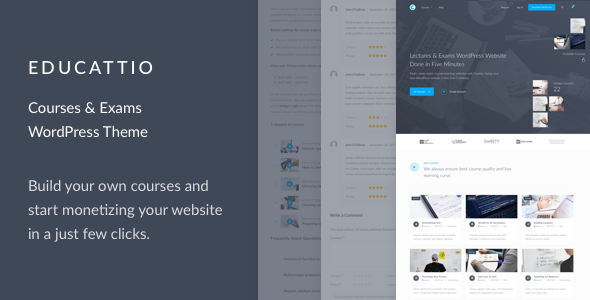 Educattio implements functionality for monetizing websites. It means that you can start earning money by selling an access for users to courses. At the moment theme has two main ways how to monetize the website. You can sell full access to all courses or you can sell access per course. For checkout and payments theme is using WooCommerce. It is possible to purchase WooCommerce Subscriptions plugin. Please note that plugin is not bundled in the package and it is required to purchase it. Create unlimited star ratings fields for your review forms. You can specify name, number of stars and reguired attributes per each rating. After review submission new average rating is assigned to course. You can create new ratings under â€œEduHub â€“ Review Ratingsâ€. All strings are properly wrapped into translation functions so it is not a problem to translate the plugin at all. You can find translation catalogues under languages folder. In Educattio we are focusing on the code quality so everything is well coded and structured. For the developers it will be pleasure to code new functionality because we are using classes and namespaces for everything so it will be easy to dig in code. One more thing, we are using annotations for do_action() and do_filter().